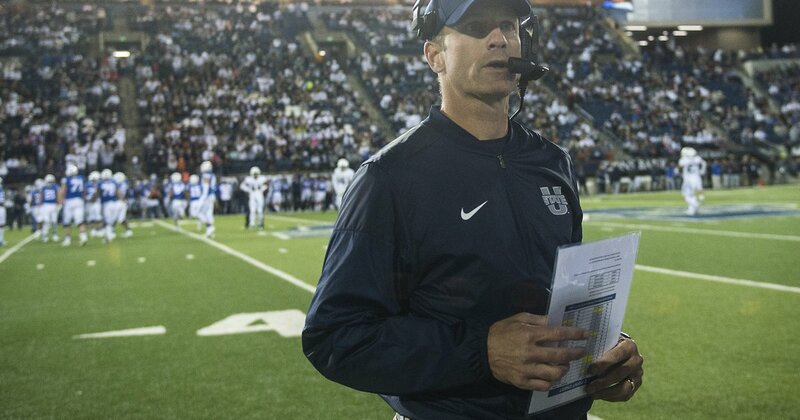 Utah State football coach Matt Wells is headed to the Lone Star State. The Aggie coach, who has taken the USU to a 10-2 regular season finish this season, has taken the next coach of Texas Tech, according to multiple reports, including the Lubbock Avalanche Journal. Wells has been linked to job openings at Texas Tech and Colorado in recent weeks. Reports from Lubbock on Wednesday called him the "leader" for the Texas Tech position. The Salt Lake Tribune has learned that plans to take offensive coordinator David Yost and defensive coordinator Keith Patterson with him on Texas Tech. Wells' Wikipedia page had been updated to reflect his hiring at Texas Tech. 8 conference record and a 2-2 record in bowl games. Wells' 44 wins are second-most in Utah State history. Under Wells, the Aggies are qualified for a bowl five of the last six seasons, including this year. Utah State thus competed in two bowl games when Wells Was USU's offensive coordinator under Gary Andersen in 2011 and 2012. Utah State Lost to Boise State for a chance to compete for the Mountain West championship. Wells, Yost and Patterson does not want to be on the guidelines for that game. The Aggies scored at least 50 points 14 times and 60-plus points six times – both school records – under Wells this season. USU's ball-hawking defense so received accolades this season. The Aggies had a top-three scoring opener in the nation this past season under Wells and Yost. Just two years prior, with a different offensive coordinator, the scoring open 107th in the nation. Under Wells, the aggies were tough at home, going 27-9 at Maverik Stadium in his six years at the helm. The NFL has seen a slew of Wells' players over the years. Wells' move to Texas Tech marks his seventh coaching job since his career started in 1997 at Navy, where he was assistant for four years. The Aggies gave Wells his first head coaching job in 2013. The Aggies gave Wells his first head coaching job in 2013 .